When studying about plants, or talking about them without any actual involvement, or any kind of a personal connection developed with the plant world, one can easily get confused or lost within their infinite kingdom. I’m not saying that every single one of us should be raised in the wild and given a chance to become botanists in order to empower ourselves with some pretty useful foundations for our modern living, but a more practical methodology of introducing nature as a natural friend to be kept for a lifetime would make this world a better place, I believe. 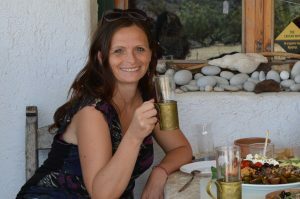 The article was originally written for and published in the issue 2018/3 of Aromatika Magazine, an online publication in Hungary to support holistic living, the practice and professional education of aromatherapy, phytotherapy, naturopathy and related subjects. 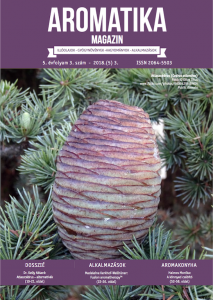 My special thanks and gratitude goes to Gergely Hollódi, editor-in-chief of this beautifully constructed aromatherapy periodical for his always encouraging support. Hope you enjoy the English version in this post. The original copy of the electronic magazine in Hungarian is available for download from the website of Aromatika Magazine. What can possibly be so tricky about it? Let’s take a look at some trees, for instance cypress, cedar and juniper. I wonder how many of you, dear readers, would be able to visualize those, describing their individual characteristics, shapes, leaves, crop or even their fragrance? Forgivable excuse could be, let’s say that, for instance Hungary where I come from is not a country of cypresses. However, you might find a collection of cypress trees at the Folly Arboretum, a special botanical park where a few decades ago they created a permaculture tree nursery. The arboretum is said to be the birthplace of many cedars which are now happily living in other gardens, castle parks and forests sporadically in Hungary. Next to the rarity of these conifers, common juniper, however, is widespread, and the essential oil made from the Hungarian crop is fairly well know. I must admit that my time to personally meet with the domestic shrub is yet to come, meanwhile, I experienced their spirit in the bottle, interestingly, through a Belgian essential oil company. Why would I bring them all together? 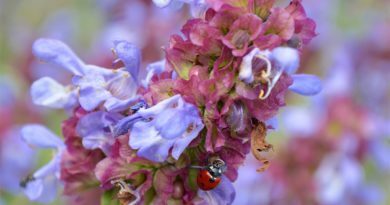 That’s because it happens with aromatherapy studies, that we get confused with their botanical classification. As opposed to cypress (Cupressus sempervirens) and juniper (Juniperus communis) from the cypress family, cedarwood (Cedrus atlantica) belongs to the evergreen conifers of the pine family. And that is also a perfect example to touch the significance of the binomial nomenclature and identification by the Latin name, when we are looking for an essential oil based on their special use. That helps to create a bridge between different cultures and languages where the common denomination can be misleading sometimes. To make things more complicated, I can add one more species. As we have Juniperus virginiana here, which is commonly known in the English language as virginia cedar or red cedar, but it is neither a cedar nor a pine. Virginia Juniper belongs to the cypress (Cupressaceae) family. When we look at its essential oil, its characteristics, features and usage are quite different from that of the essential oil of Juniperus communis and Cedrus atlantica. 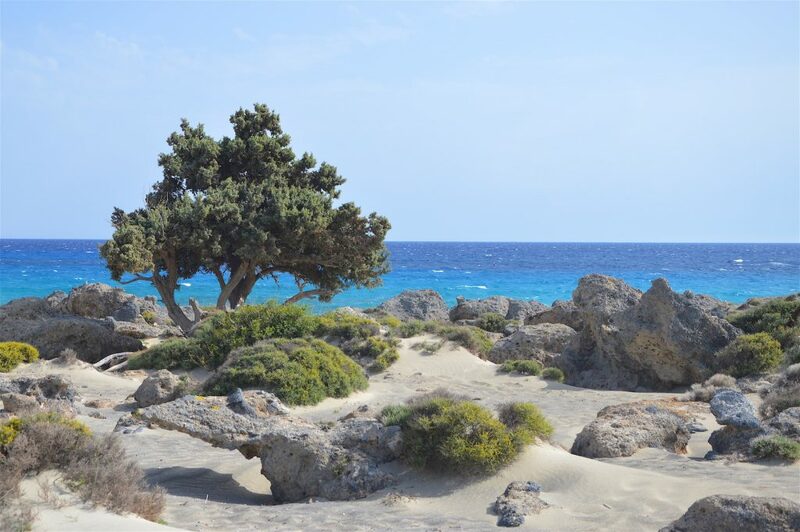 If you have read any of my previous aromatic essays, then you may know they are majorly influenced by Crete, and so it is righteous to ask about these trees there on this magnificent island. 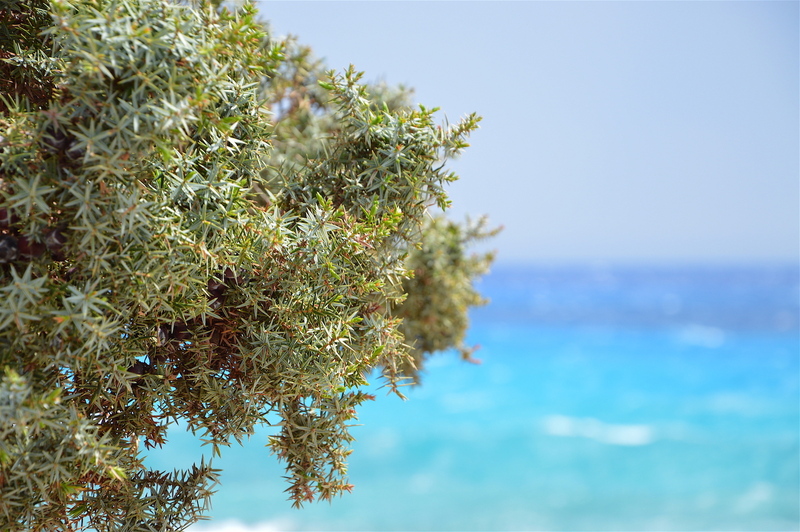 You can easily meet cypress and its beautiful local varieties all over Crete, I often photograph them and some of my adventures with cypress were featured in Aromatika Magazin 2016. 3.4. Cedarwood (Cedrus atlantica), the wonderful tree from which that amazingly sweet, woody and balsamic essential oil can be distilled, however, is not found on Crete. Despite the fact, that touristic guides, mostly using natural treasures for headlines in promotion, keep mentioning areas with cedars. That comes from the mis-leading translation of the Greek word ‘kedros’. Unlike the mainstream tourism industry today, I wish to see nature for which we go deeper as a real connection and understanding. 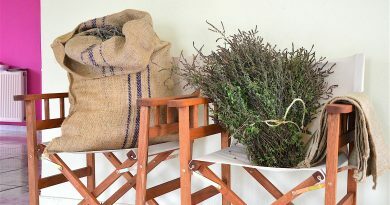 Nevertheless, when Greeks talk about ‘kedros’, they talk about the local varieties of Juniper that grows in small patches at multiple locations. Juniper trees are shaped by the strong wing in the area. 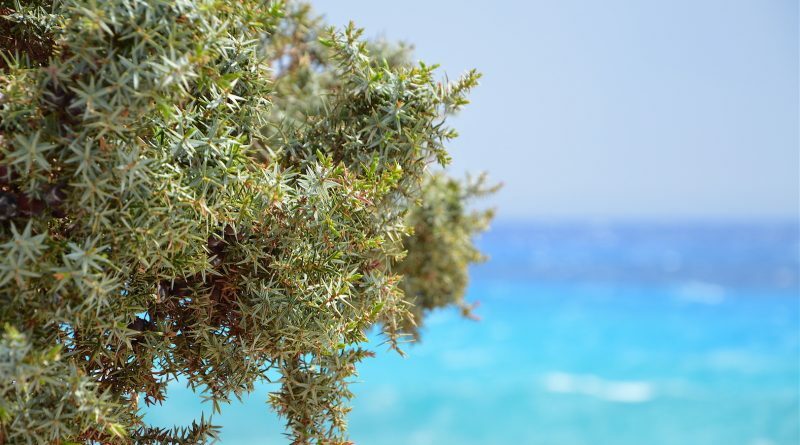 In reality, what you would find there on these white sand beaches is Juniper. And that is certainly just as truly magical. Those spreading high evergreen trees way overgrown there and definitely not something you could call shrubs anymore. On this bright hot day, layers of wood and green combine incredibly with the colours of the sea, shades of emerald to azure and deep blue. We descend the declivitous path with a rich vegetation of wild flowers, bushes and shrubs, and I come to sense these mesmerising feelings as we walk through the slopes approaching the sandy coastal section. The wind-blasted foliage and unbalanced crowns make the landscape not a bit mystic, demanding further respect for the supernatural transforming capacity of nature. 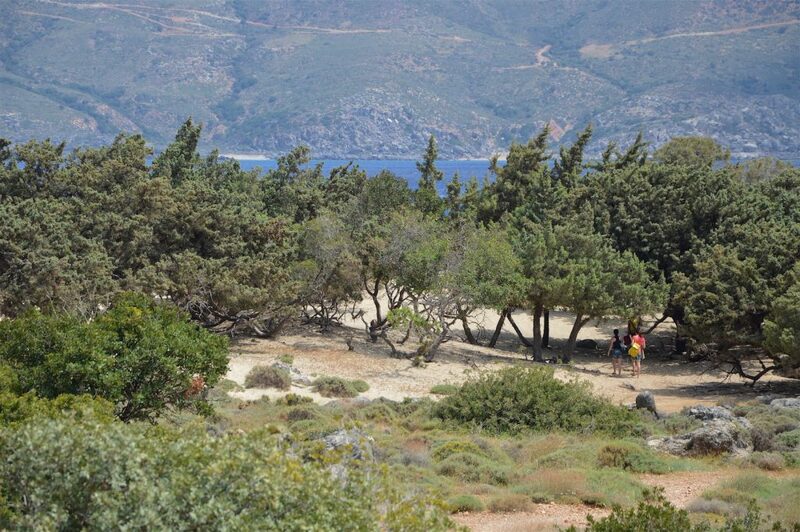 At a first glance, spherical bushes of various size and colour growing alongside our path, initially may even seem to be average, being sort of a characteristic of Cretan landscape on the coastline. 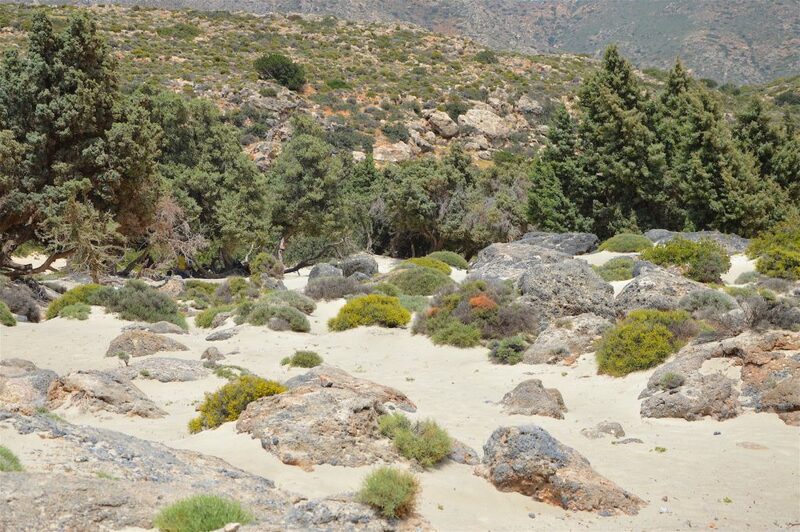 Then we come closer to a distance where junipers are more definitely recognisable. And there comes this strong feeling. As pure love that warms you inside from the first time, physically, yet being esoterically present with the unexplainable bond that would last for ever. That’s how I glimpsed at the garden of Eden, which laid amongst solid rocks as guarding lions spread around the masterfully sculptured texture of moving sand. That’s how I was standing there long, taking and receiving the clear flow of the Universe. Taking my time, watching my surroundings while looking inside, somewhat left well behind by rapid members of our small group. While I thoroughly enjoyed the presence, it may also happen for someone to be difficult coming within union of these harmonious pure energies. The person may not be ready to face it, to let something go. Maybe just the right method or support is missing, and sometimes one does not see the wood from the tree, and not able to receive in order to step out from his/her own limiting beliefs. It might be a good idea to see where they come from, where they are at the present moment, and where this situation might be blocked. Then to create a customised synergy to help eliminate the restrictive factors. 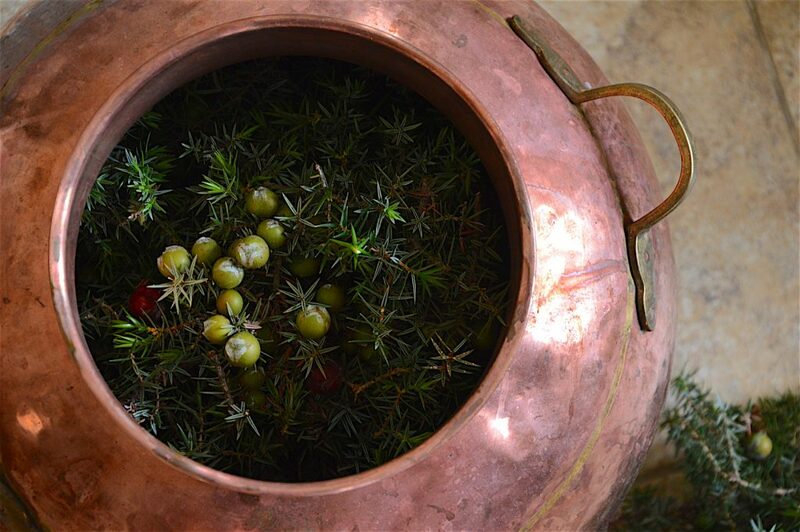 As the wisdom of the culinary art is inherently based on the utilisation of the ingredients, likewise, we can easily find the links between the mental-emotional-spiritual aid juniper has to offer, and similar aspects in regards to its physiological applications. Cleansing effect is essential here as well, whether we use juniper as brewing an infusion and drink as tea, apply as a kitchen spice both giving flavour and helping the body’s detoxification. The herbs, the essential oils and its hydrolat can all be used in many ways for the maintenance and healing of the digestive, elimination and circulatory system. Some would rather chose the alcoholic distillate of juniper for the cleansing purpose, and perhaps they are right with that a moderate application, gin can make a good and enjoyable service to its consumers. Anyhow, proper administering of juniper, considering its diuretic nature and effects on the kidneys, for instance, requires professional care and knowledge. 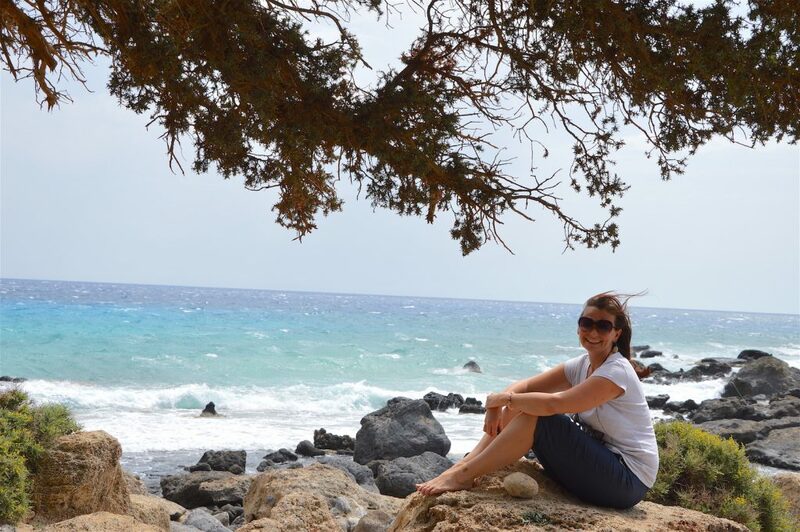 The juniper species you would typically find on Crete is not Juniperus communis, but other varieties depending on their location. Juniperus oxycedrus subsp. oxycedrus (again we see that funny little cedar once more puts its branch in the mess of nomenclature) grows on the rocky mountainous parts, and the largely taller Juniperus oxycedrus subsp. macrocarpa lives alongside some coastal areas. From the latter variety, we carried out an experimental mixed distillation, which provided exciting and interesting experiences. A mixed distillation in many senses. On one hand, that we used both the conifer twigs as well as some green, beige and blue berries just being in their respective maturity stages. On the other hand, because of the distillation method, filling both the alembic pot and the column tower with plant material, combining the hydro- and steam distillation technique. Being an experimental artisan distiller, I have the freedom to decide individually for these criteria and also to intuitively give space and follow the processes. Thanks to the characteristics of this specific distillation, as well as our exploring curiosity, we sat eight hours with the still on the fire, and eventually had to close the process only because we had visitors for dinner that had to be compatible with the apparatus set in the middle of the room. An interesting experience during this distillation was as if the juniper was giving itself in fine waves, slowly, mildly allowing its liberating aroma to be released with moderation. 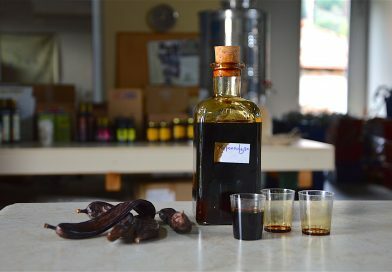 Obtaining a very pure, completely transparent distillate that is slightly balsamic and sweet in nature, but rather woody and dry, the liquid creates some cold and spicy sensation in the oral cavity as it moves backwards. Its fragrance has similar characteristics, yet rather moderate. That fine background capacity can be noticed when smelling the gentle power of juniper hydrolat. It could be experienced as an energetic tuner towards the third-eye, while some would be captured by feeling its balancing, strengthening nature in relation to the solar plexus. For my own use, I applied juniper hydrolat as suggested by protocols for general intake, 30 ml mixed in 1 liter of water, slowly sipping during the day. It was giving me a refreshing variety compared to the usual taste of pure water, coupled with the extra cleansing properties. Juniper berries mature over 3 years, changing their colour from green to red and dark blue/black. Juniper berries in the sand. Rooted. Being held by a majestic Juniper tree.